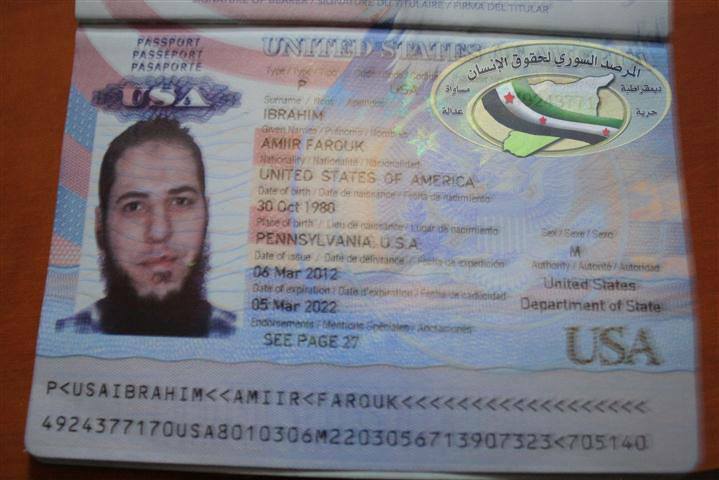 A passport said to belong to an American citizen was found among a number of identification documents belonging to foreign fighters who have been waging jihad with al Qaeda inside Syria. The documents were discovered at a base abandoned by the Islamic State of Iraq and the Levant, an al Qaeda affiliate that operates in Syria. The American passport belongs to Amiir Farouk Ibrahim, who was born in Pennsylvania on Oct. 30, 1980. Ibrahim’s passport was issued on March 6, 2012. Ibrahim also possesses an Egyptian passport, which was issued on Sept. 23, 2012 under the name Amir Farouk Zaki Ibrahim. His Egyptian passport also states that he was born on Oct. 30, 1980 in the United States. The nationalities of the individuals identified by the documents are as follows: one dual citizen, of the US and Egypt (Ibrahim); one individual from each of Qatar, Bahrain, and United Arab Emirates; two each from Iraq, Turkey, and Tunisia; and two from Saudi Arabia (of the three passports from Saudi Arabia, two appear to identify the same person). Another document appears to identify a man born in Egypt. SOHR stated that “[t]he documents were found after the ISIS retreated from the town after intense clashes last week with the YPG,” a Kurdish militia tied to the PKK, a Marxist Kurdish terror group based in Syria. The Islamic State of Iraq and the Levant, which is referred to by the acronyms ISIS and ISIL, has been battling the YPG for control of a border crossing point and several towns in northern Syria. “We do not know the fate of the owners of these documents, whether they are dead or alive and still active in Syria,” the SOHR concluded. Al Qaeda and other jihadist groups often collect travel documents and identification cards of recruits after they join the fight in new countries. If Ibrahim’s identity as an American citizen is confirmed, he would be the second American known to wage jihad in Syria in the ranks of al Qaeda. Eric Harroun, a former US soldier, is in US custody and is charged with fighting alongside the Al Nusrah Front, al Qaeda’s official affiliate in Syria.